Welcome to L.A. Honda World! Service Your Vehicle at Honda World Downey! At Honda World Downey we know you think a lot about where to take your car when it needs a checkup or repair. Bring it by the Honda World Downey Service Department to be sure you are giving your car the best care possible. Our expertly trained service staff are experienced in knowing how to properly service any vehicle. The Honda World Downey service department will always take the necessary measures to make sure your car makes it back on the road safely. Great customer service and Quality Vehicles. Sales Rep Raul and Finance Manager Juan took care of us Walked out with a 2019 accord sport. Love it! I want to thank Mario George, Saul Hernandez, and Mike for their diligence at getting me the deal and car that I needed. Especially since I was a first time buyer. They were not pushing anything I didn't want, they listened to what I wanted, worked with me on the numbers I was looking for. They were professional, kind, and knowledgeable. They were also very inclusive since I took family with me to make the best choice and they respected and treated them all with quality service. Thank you again gentlemen!! Honda in Downey gives us great customer service !! They worked with us to get the car we wanted plus , worked with payments we can afford . Thank you Antonio for making work for us . Joseph thanks for being patience with us. Thanks in showing us the cars. Great teamwork Honda . Go visit Honda helpers . They really do help. Honda World has good cars and employees that are on your service and are good people that are very honest and communicate with you giving you as much as information. Very satisfied with our experience here... we came here looking for a car for my wife and we got everything we wanted. The salesman helped us out a lot, and were very patient and did everything we asked. Angel De La Cruz and Hassan, were extremely helpful with us. They didn't try to pull anything on us, and had our back every step of the way. Full 100% 5 stars to these guys! Definitely recommend coming here if you're looking for a car. We were in and out very quickly! We are your Downey, CA New and Certified Pre-owned Honda dealership near Los Angeles, Bellflower, Buena Park, Carson, Lakewood, Monterey Park, Norwalk, Pico Rivera, Whittier, Compton, Long Beach, Alhambra, Anaheim, Beverly Hills, Burbank, Culver City, Fullerton, Glendale, Irvine, Pasadena, Santa Monica. 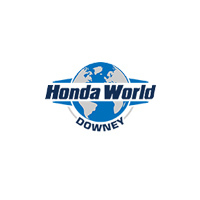 Are you wondering, where is Honda World Downey or what is the closest Honda dealer near me? Honda World Downey is located at 10645 Studebaker Rd., Downey, CA 90241. You can call our Sales Department at 888-458-9404, Service Department at 888-522-0789, or our Parts Department at 888-814-1191. Although Honda World Downey in Downey, California is not open 24 hours a day, seven days a week – our website is always open. On our website, you can research and view photos of the new Honda models such as the Accord, Accord Hybrid, Civic, CR-V, Fit, HR-V, Odyssey, Pilot or Ridgeline that you would like to purchase or lease. You can also search our entire inventory of new and used vehicles, value your trade-in, and visit our Meet the Staff page to familiarize yourself with our staff who are committed to making your visit to Honda World Downey a great experience every time. Looking for a new 2018 or 2019 Honda? Look no further than Honda World Downey in Downey, California. We offer a full lineup of new Honda vehicles. Our knowledgeable Honda World Downey new car dealer staff is dedicated and will work with you to put you behind the wheel of the Honda vehicle you want, at an affordable price. Feel free to browse our online inventory, request more information about our vehicles, or set up a test drive with a sales associate. As a leading Honda dealer near Los Angeles, Honda World Downey also has a wide variety of pre-owned cars, trucks, and SUVs for you to choose from. Each of our used vehicles has undergone a rigorous inspection to ensure the highest quality used cars, trucks, and SUVs in California. Stop by Honda World Downey or search our online inventory to find the used car, truck, or SUV that is right for you. We have used cars, trucks, and SUVs for every need and budget. Our expert staff will work to get you in the vehicle you want for an affordable price. Visit our Honda World Downey finance page to get pre-approved today! The staff within our Finance Department is dedicated to putting you in the car you want, at a price you can afford. We also offer competitive auto leasing options for our customers who are not looking to purchase or finance a vehicle. Whether you are looking to finance or lease your new Honda car, truck, or SUV, our finance experts will work to arrange affordable payments for our customers. Our state-of-the-art Service Department here at Honda World Downey will keep your new Honda vehicle or used car in excellent condition. The diagnostic equipment operated by our expert mechanics will detect any issues that may be occurring in your vehicle so that our Honda trained service technicians can fix the problem right the first time. We offer all the auto services, maintenance, and parts you need to keep your vehicle running like new, even if all you need is an oil change. Visit our Service Department page to schedule a service appointment, or our Parts Department page to order parts for your new Honda, or for more information about any of the services offered by Honda World Downey.